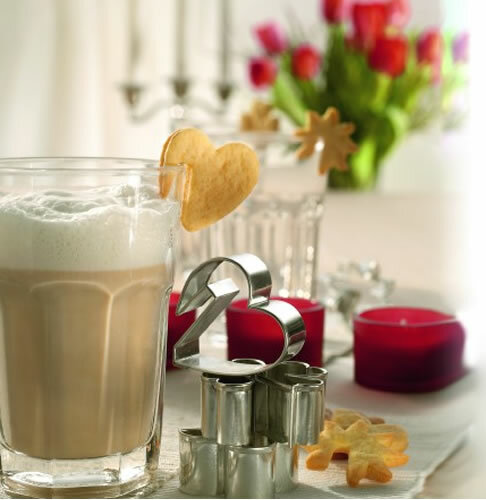 Perfect Cookies to Pair with Your Holiday’s Hot Drinks! These cookies will warm your heart! The cutters are made of durable stainless steel and are specially designed to cut the cookies as little “hangers”. Use a favorite gingerbread or sugar cookie recipe and “hang” these darling cookies from your coffee, tea or cocoa mug! These cookies are cute (and delicious!) plain or you can have fun jazzing them up with sugar decorations or icing. 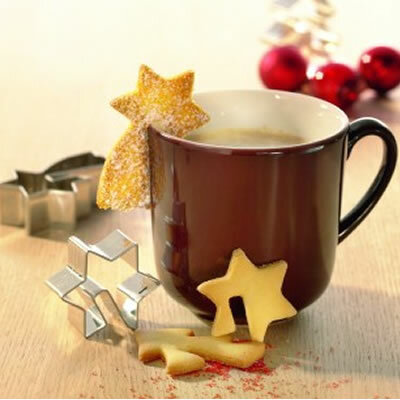 We have a Christmas Cookie Cutter Set which includes a star, a shooting star, a tree and an elf’s hat. Our Four Seasons Cookie Cutter Set includes a sun, a heart, a shamrock, and a flower. Our Boy and Girl Cookie Cutter Set feature a boy and a girl with pigtails. These cookies are a unique and whimsical addition to any birthday, holiday, or just anytime year round fun. This entry was posted in Baking Inspiration, Christmas Baking Ideas, Cookie Recipes & Ideas, Winter Baking and tagged Birthday Baking, christimas, cookie, drink, hang, hanging cookie, party, tea by Fancy Flours. Bookmark the permalink.